Each event features two live oral history interviews and an Open Mic. The Open Mic participants will be chosen by drawing names that interested storytellers deposit in a box at the beginning of the event. Individuals whose names are drawn have five minutes each to share their stories on the day’s topic. Migration Stories: Syracuse is a city of migrants. People with roots in the American South, the Caribbean, Africa, Latin America, and elsewhere call the city home. Share your story of coming to Syracuse; ties to the old home; or adapting to life in your new world. Prison Stories: The U.S. incarceration rate has been the highest in the world for over a decade. Prison has become a common American experience. Share your story of incarceration; ties to individuals in prison; the absence of an incarcerated family member or friend; prison visits; or adjusting to life after prison. Learning Stories: What does it mean to learn or to be educated? Share your story of how you learned; where you learned; what you learned; love of learning; teaching others to learn; obstacles to learning; or things you wish you had not learned. Love Stories: “Tell me who you love, and I’ll tell you who you are.” (Creole proverb) Share your story of old love; hard love; sister love; unexpected love; parent’s love; lost love; looking for love; childhood love; misplaced love; brotherly love; or renewed love. Your Story! is a Black Syracuse Project (BSP) initiative. 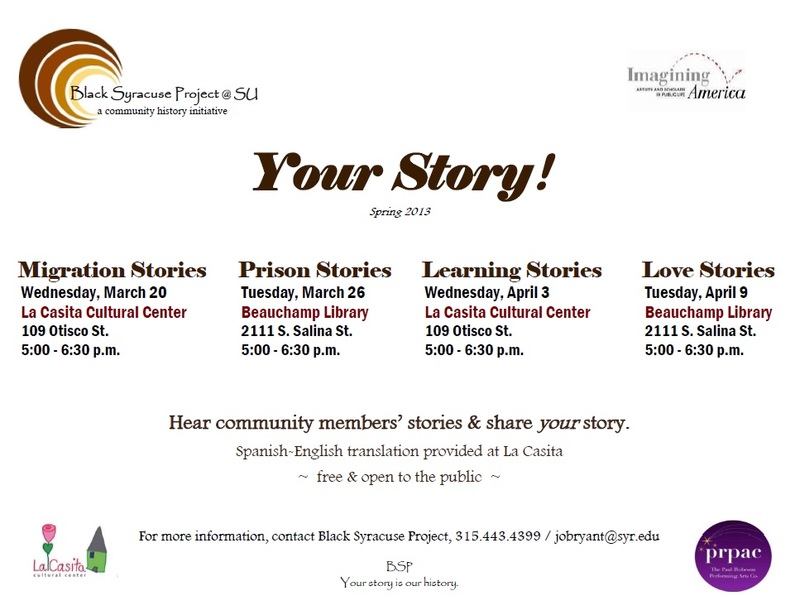 The Spring 2013 series is produced in collaboration with Imagining America, La Casita Cultural Center, and the Paul Robeson Performing Arts Company. BSP explores and documents the history of people of color in Central New York and is housed in Syracuse University’s African American Studies Department. La Casita is a cultural, artistic, and educational center supported by Syracuse University’s College of Arts and Sciences and the Office of the Chancellor. Brenda Muhammad was born and raised in Central New York but her parents are both from Arkansas. Every other year, Brenda and her extended family participate in a family reunion. There, they compare their new genealogical research and flesh out their heritage. Brenda is being interviewed here by Joan Bryant and Claire Enkosky. Every time I would go to Arkansas, if I was in Little Rock, I would go to vital records or the court house and I would take a little bit of money that I have an buy someone’s birth certificate or someone’s death certificate or a marriage license. Jessie Grace Griffin is interviewed here by Tasneem Grace Tewogbola on July 29th, 2010. Yes, there was a lot of people in Syracuse from the South but it was a long time before I met anybody from Georgia. Where were a lot of people from?